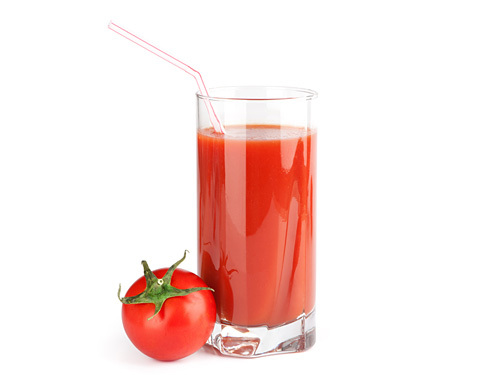 Fresh tomato juice is a well acclaimed vegetable juice which not just tastes best but easy to make as well because it does not require any cooking. This universal juice can be drunk alone or with ice or used as an ingredient to make cocktails. 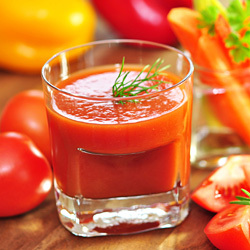 Place an empty container beneath the nozzle of juice extractor and process tomatoes, carrots and celery. When juicing process is complete, add salt and black pepper in extracted juice and mix well. Add ice cubes in chilled serving glasses and pour juice over it. Serve it for immediate consumption. Add 1/2 teaspoon Tabasco sauce or 1 cayenne pepper to make it spicier. Serving Ideas: Serve it alone or with snacks as healthy summer drink. Give it to kids during summer or use it to make a cocktail like Bloody Mary. The pulp and skin are left behind, which, health experts say, is something people should keep in mind when juicing. That pulp and skin can contain key nutrients as well as fiber.